The Taj Baghvan Pench Jungle Lodge is situated in the buffer zone, minutes from the park entrance. Its twelve luxurious bungalow suites are situated amidst the forest, along a dry riverbed. Baghvan is aptly named after one of India's iconic symbols, the Bengal tiger. 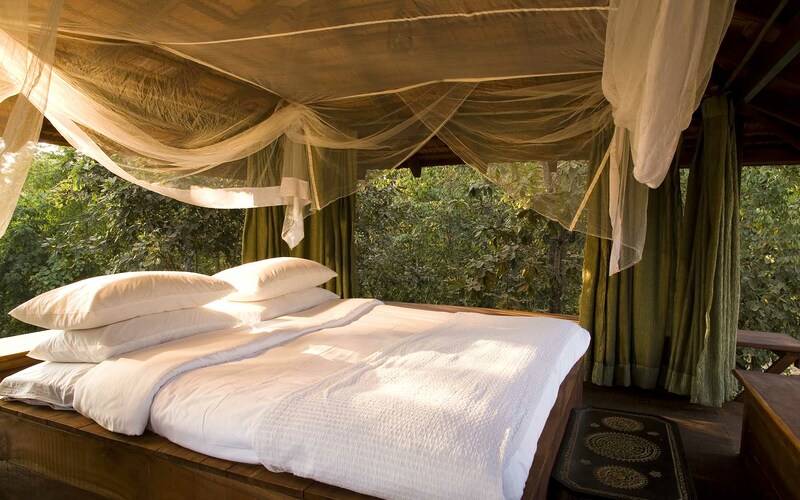 Each bungalow suite has a machan (a covered rooftop lookout) equipped with a bed, mosquito net, hookahs, and fan to savour a true jungle experience – or almost! A covered passage connects the bedroom on the lower level with the bathroom that has both indoor and outdoor showers. Copyright © 2000 - 2014 [the-south-asian.com]. Intellectual Property. All rights reserved.